You might be scratching your head as to why a car maker would invest a lot of money to bring out a new sedan considering the current significant interest in SUVs by new vehicle buyers. First off, a very good reason is sales volume, or opportunity. Six million cars—sedans, coupes and convertibles are sold each year. The mid-size segment accounts for about two million sales, and that’s where the Nissan Altima fits in. Secondly, Nissan has done some research and it turns out that many young people are interested in sedans. By the numbers. 44-percent of Gen Z buyers and 30-percent of Gen Y buyers are interested in sedans. Why? Price, fuel efficiency and “I don’t want daddy’s car” are three main reasons. Nissan has sold 5.7 million Altimas over the last 25 years and now the sixth generation, entirely new 2019 Altima has arrived. Nissan has made a significant investment in the new Altima that now rides on an all new platform. Three key new features of the Altima are 1) it has two all-new engines, 2) it is the first Nissan sedan to offer all-wheel drive, and 3) the inclusion of a high level of driver assistance safety features with Nissan’s Intelligent Mobility and Safety Shield 360 including Pro-Pilot Assist. 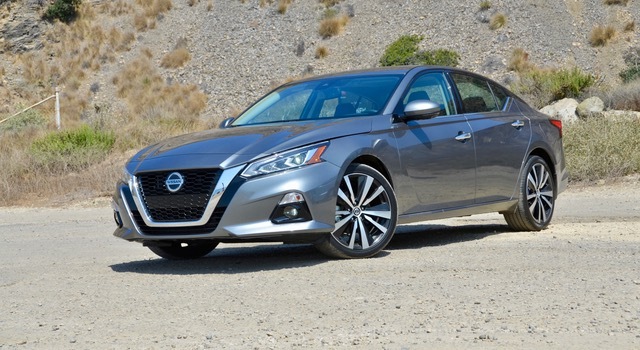 The front-wheel drive 2019 Altima is available in S, SR, SV, SL and Platinum trims with base prices ranging from $23,750 to $34,780. All-wheel drive (AWD), offered in response to the desires of buyers in northern U.S. markets, is available on all trims for an additional $1,350. 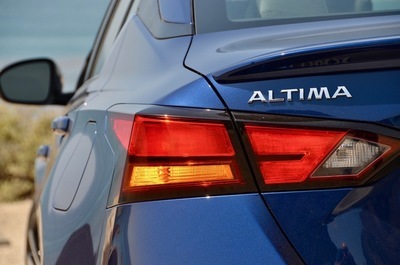 Like many vehicle redesigns these days, the new Altima is longer, lower and wider. It’s also a bit lighter and has a somewhat stronger platform coming from the extensive use off high strength steel. The standard engine across all trims is a 188-HP, direct injected 2.5-liter four-cylinder. It’s mated to a CVT-continuously variable automatic transmission and is the only engine offered with AWD. EPA test-cycle fuel economy ratings for front-drive models are 32 mpg combined with 28 city mpg and 39 highway mpg. 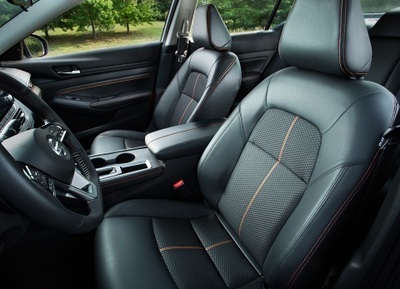 All-wheel drive models are rated at 30 mpg combined with 26 city mpg and 36 mpg highway. Following a common industry trend there is no longer a V6 engine. SR and Platinum models have an optional 248-HP 2.0-L variable compression turbocharged engine that’s mated to a CVT and only available with front-wheel drive. It’s the first ever variable compression engine. A unique piston to crankshaft mechanism changes the engine from 8:1 for performance to 14:1 for fuel efficiency. EPA test-cycle ratings are 29 mpg combined with 25 city mpg and 34 highway mpg. The SR trim with this engine is $4,050 additional and the Platinum trim is $3,000. 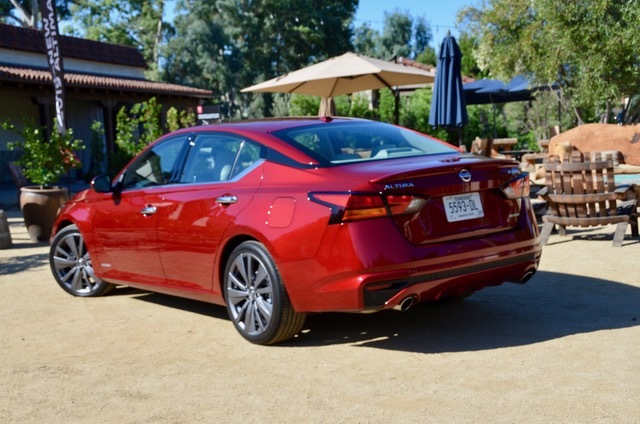 At the recent Altima national media introduction I drove models equipped with both engines. Both deliver good overall performance, with the VC-T 2.0-L and its increased horsepower certainly more responsive. Nissan does a better job than most in making its CVT perform smoothly with low overall powertrain noise. On our test drive, my driving partner and I averaged 30 mpg over some twisty and hilly roads with the 2.5-L engine and 34 mpg over more flat and level terrain while driving the VC-T 2.0-L engine. As usual, fuel economy varies with terrain, driving speed and vehicle load. Also note that the VC-T 2.0-L engine requires premium fuel. Nissan is ramping up with more driver-assistance safety equipment being made standard across the board. Automatic emergency braking, driver alertness warning and forward collision warning are standard. On SV trims and above a Safety Shield 360 package is optional, adding Automatic Emergency Braking with Pedestrian Detection, High Beam Assist, Rear Automatic Braking, Lane Departure Warning, Blind Spot Warning, and Rear Cross Traffic Alert. The Altima SV, SL and Platinum trims come standard with Nissan’s ProPIlot Assist. It’s not a self-driving feature but one that keeps the Altima centered in the driving lane using cameras and sensors working together with the cruise control. Altima is Nissan’s brand ambassador and is very well appointed both in and out to hold that position. Nissan designers focused on creating an expressive design. On the outside the Altima is both stylish and refined with interesting body surfacing. Inside, the instrument panel sits lower providing a more open cockpit. Premium materials and contemporary style, colors and details provide a highly comfortable and modern feeling. 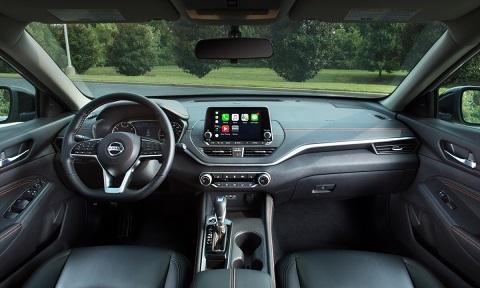 With seating for five, an 8-inch touchscreen, Apple CarPay, Android Auto, USB ports plus available premium comfort features all make for a pleasant driving experience. 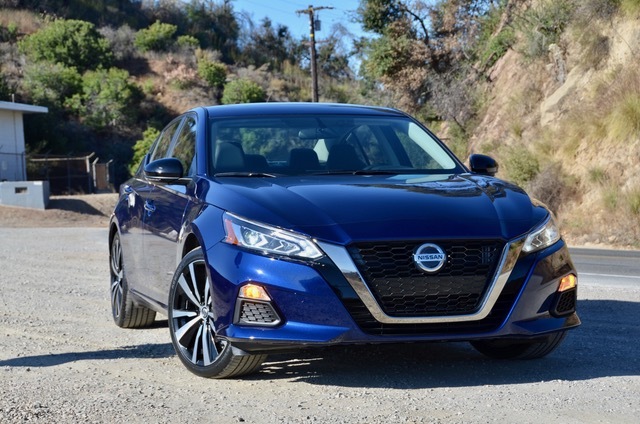 More information, details and specifications on the 2019 Nissan Altima can be found at www.nissanusa.com. A limited-production launch edition of the new 2019 Altima, the Edition One, will be based on the Platinum trim with the VC-T engine and equipped with unique wheel finish, floor mats and badging. A spoiler, ground lighting and illuminated kick plates with scarlet, black or pearl white exterior color choices will round things out. Only 3,900 will be built priced at $35,750 plus $895 for shipping. This report comes from an invitation-only Nissan launch event that allowed special access to the vehicle and executives. Nissan provided my overnight accommodations, meals, and transportation. Discover More Unbiased "Tell-Not-Sell" Nissan Vehicle Research Information Than Anywhere!